Q1 – So Nick, you have a new book out and it’s not a Historical Fiction book like we might have expected… What made you decide to write a Science Fiction book? I’ve always written sci fi – in fact I wrote two novels before I even considered historical fiction. I enjoy having a blank slate to start with and the freedom that the genre gives you. This is just a short ebook but I might look to write a full novel in the near future. Q2 – The book is made up of three short stories, all of which I thought were brilliant. You have a talent for writing short stories, you give enough of a story to make the reader happy and feel they take something away with them but hold back enough to encourage your readers to come back to you for more. Where do your ideas come from? Are they simply bigger ideas that don’t really come to full fruition? Thank you. I try my best to resolve the stories in a compelling way. That doesn’t always mean a twist but really it’s not so different to a novel – the story just has to move a little more swiftly and reach a satisfying conclusion. The ideas come at different times. ‘Four Numbers’, for example, I wrote specifically for the collection. Whenever I have an idea for something, I note it down – I might come back to it the following week or five years later. Q3 –Are there any particular books or authors you’ve enjoyed within the Sci Fi genre? I’ve always been a big fan of Iain M. Banks and Douglas Hill, a Canadian author. Q4 – Are there any other genres you might try your hand at one day? Possibly fantasy; and I’d like to try something contemporary at some point. Q5 – Who have been your biggest influences/supporters within the writing community? Writers are very supportive of each in general and we can add to that bloggers and reviewers like yourself who are now a crucial part of the writing world. I also belong to the Historical Writers Association and have many friends in the industry who I keep in touch with via social media. When meeting in ‘the real world’, a few beers are usually involved. Q6 – How important to you is the feedback from your readers? I’m always very interested in what readers have to say and I can’t help reading every review. Fortunately most are positive! I don’t think I would ever alter anything because of feedback unless there was an obvious theme. Everyone has an opinion – including editors and agents. Of course I always listen to them but it’s very important as a writer to know your own mind. Q7 – How do you deal with negative feedback? Violence! No, honestly, if I read something that strikes a chord then it could be something to learn from. But usually I just disagree and swear about it! Over time you get used to it but unfortunately they tend to stick in your mind more than the positive comments. Q8 – For anyone who is not familiar with Agent of Rome books how you would describe the series to them? The series follows Roman ‘security service’ officer Cassius Corbulo – plus his ex-gladiator bodyguard Indavara and Christian servant Simo. Their adventures have taken them all over the eastern Empire and – hopefully – combine mystery, action and intrigue. Q9 – If you had to pick, which of your books would you say you’ve most enjoyed writing or which are you most proud of and why? I really enjoyed writing ‘The Far Shore’ – the third book of the Roman series. I suspect it was because I knew it was working out well. Like all novels, it turned out differently to the original conception but it was exciting to write and hopefully that translated for the reader. As for ‘most proud’ – that probably goes to book two, ‘The Imperial Banner’. Second novels are traditionally difficult and this one took the series in a different direction. I was also working as a teacher and had less time due to the publishing deadline. Q10 – Future plans? More Sci Fi? I’m sure we’d all like to know what you’ve got planned. More sci fi, I hope; and some historical fiction too. Watch this space! This entry was posted in 10 Questions With... and tagged Authors, Book club, Book Lovers, Book Reviews, BookBlog, Books, Ebooks, Historical Fiction, Kindle, Nick Brown, Reading, Science Fiction on April 21, 2016 by Bairdy1985. Today i bring to you an interview with author Keith Nixon who kindly offered to answer some of my questions. I hope you find this as insightful as i did myself. Since I was about nine but I really started writing properly about 25 years ago in my early 20’s. It was a historical fiction novel – my wife’s grandfather stole a train in WW2 Italy to escape from the Germans. I initially wrote historical fiction as I felt I could only write something around a central event. I started my Roman books because of a visit to Maiden Castle. It’s a massive structure and I wondered how the Romans had managed to take it. Otherwise the drive to put pen to paper (or finger to keyboard) is just something inside. I’ve no idea what produces it. Q2 – I’ve read 3 of your books so far and they cover quite different subjects. Do you have a particular favourite genre? That’s a very difficult question to answer. It’s usually from a single spark. It might be an event, big or small that either happens to me, I hear about or read a newspaper article on. Or it might be a person and their behaviour or a couple of words that just makes me want to tell a story around it. I’m a fast writer, but a slow congealer of a story. I take quite a bit of time pulling all the threads together and reworking story arcs. A 60-70,000 crime novel will take me six months. Considering I can write 1,000 – 2,000 words in a day if I’ve a clear run, that’s quite a stretch. Historical fiction is more like nine months, just because of all the layers of research that need to go in. Mind you, The Eagle’s shadow took nearly two years and nine redrafts. Q4 – I’d be interested to know out of the novels you’ve wrote do you have a favourite?And if so why? I’m up to seven published novels now and two more currently being beta read. They’re all a bit different. I’d probably choose The Fix, primarily because I’ll likely never produce anything like it again. I just had a lot of fun pulling it together and I never intended to have it published. Putting it out opened up so many things for me – a whole world of friends and experiences that I wouldn’t have otherwise had. My biggest influence initially was Ian Rankin. His was the first crime novel I read (the seminal Black and Blue). In terms of people I know and have worked with the list goes on. The crime genre is very supportive. There are lots of writers, bloggers and reviewers so willing to give of their free time. Q7 – I note on your website you’ve done a few reviews yourself. Is this something you enjoy and plan to do more of? Same issue of reading less really. I do enjoy reviewing, it’s a great way of connecting with other authors. I tend to cover crime (unsurprisingly), debuts and Scottish authors, but not exclusively. I’d like to do more, but time is limited – writing a lot, busy job and family! Extremely important. Reviews are very hard to come by. I’ve sold about 15,000 copies of The Eagle’s Shadow, yet (at time of writing) reviews on Amazon UK are at 92. That’s a tiny level of respondents. I’ve learned a lot from feedback, primarily because as the author it’s a wood for the trees thing. I can see and hear all the behaviours and speech of my characters, but the reader is in a different place. If I’ve badly communicated the plot, they’ll soon tell me. It helps me grow as an author. I’ve been fortunate enough to have far more positive responses than negative. Q9 – I particularly enjoyed The Eagles Blood & The Eagles Shadow, any plans to revisit Caradoc any time soon? Caradoc was the one that properly started it for me so absolutely, yes. They’re my best sellers, but the longest to write. I’m just planning my as yet unnamed third Caradoc novel (it’ll have Eagle in the title, for sure). Ironically it’s my 10th novel. Once Caradoc sails away then I expect Fionn will take up the mantle with his own series. If you haven’t already take a look at my Author Spotlight post for Keith to see why i enjoy his books so much. This entry was posted in 10 Questions With... and tagged Authors, Book club, Book Lovers, Book Reviews, BookBlog, Books, Caradoc, Ebooks, Historical Fiction, Keith Nixon, Kindle, Reading on January 21, 2016 by Bairdy1985. Today i bring to you a new feature on my blog called “10 Questions with”. It is my hope over the next few months i can bring you some interesting Q&A’s with some of the authors whose work I’ve recently read/reviewed. Q1 – For anyone who’s read my review of The Serpent Sword I’m sure they will be aware how awesome your book is but for those who’ve not read it yet what would you say to convince them to read your book next? Q2 – After reading the first book you’ve left me wanting more. When can we expect the next book to be out and can you give us any juicy info on it? The sequel is THE CROSS AND THE CURSE. Beobrand stands with the King of Northumbria in battles of great portent and continues his rise to prominence. He wants nothing more than to settle down, but he soon finds himself beset with enemies old and new. He even fears that the power of a curse has him in its grip. Fated to become a famed warlord, Beobrand confronts his foes with cold iron and bitter fury. On his quest for revenge and redemption, Beobrand grudgingly accepts the mantle of lord, leading his men into the darkest of nights and the bloodiest of battles. THE CROSS AND THE CURSE is already written and should be available in the next few months. Probably early 2016. I actually started writing it back in 2001! I saw a documentary about the Castle of Bamburgh in Northumberland and how it had been the seat of the kings of a long-forgotten kingdom called Bernicia. I had a vision of men pulling their ships up onto the beach below the crag of Bamburgh Castle and I just sat down and started writing. I had been working on the book on and off for a couple of years when one day, Bernard Cornwell released his first Uhtred novel. It was set a couple of hundred years later, but began in Bamburgh and featured a similar young man who would become a great warlord. I was despondent. I gave up and stuck my book in a drawer for about ten years! It then became clear to me that Amazon and e-books made it possible to self-publish and make money through writing in a way that had never before been possible. So I set myself weekly writing targets and a goal for completing the book and finished the first draft in about eight months. Rework and clean-up of the manuscript took another couple of months and then I gave it to several friends and family for their feedback. The test readers caught lots of errors and gave me some great ideas for how to make the book better. I did some more work on the book and then sent it to my dad to edit. He has a great eye for detail and grammar and caught almost everything else that had slipped through. The next year went by with THE SERPENT SWORD getting pitched to publishers by my agent, while I worked on book 2. In the end though, I didn’t sign a deal with any publishing house and so I decided to self-publish. Formatting and cover design took a month or so. I’m not really sure. I have always loved historical fiction, and for some reason when I started writing this story, I couldn’t let it go. I had started many stories in the past but never got beyond five or ten pages. Starting is actually the easiest thing. Finishing a complete novel is where the difficulty lies. Anyway, it sounds like a cliché, but in some ways the story of Beobrand and The Serpent Sword found me! As you say, some readers and writers, believe that the historical accuracy is the most important thing in historical fiction. I look at it a slightly different way. I will never knowingly include anything historically inaccurate without informing the reader in a historical note, but I believe that the story is more important than the history. If the setting and events have the feeling of authenticity, and the story entertains the reader, then I think my job is done. Several readers have commented about how much they feel they have learnt of the history of Northumbria from reading The Serpent Sword, but it was never my intention to be didactic. If a story is compelling and exciting, and you come away learning some history, that’s a bonus! I grew up reading fantasy and science fiction, so I wouldn’t rule out writing something in those genres. Particularly fantasy. George R.R. Martin said in an interview with Bernard Cornwell: “It has long been my contention that the historical novel and the epic fantasy are sisters under the skin, that the two genres have much in common.” I agree with him and can easily see myself writing an epic fantasy, but for some reason, having a story grounded in reality feels more natural to me now than perhaps it would have if I’d taken up writing seriously when I was younger. I’m also a huge fan of westerns and have seriously considered writing in that genre. I guess it is still historical fiction, just in a different period. In terms of which writers have been the biggest influence over a long period, I would have to say Bernard Cornwell. His Warlord Chronicles are what got me to consider writing The Serpent Sword and its sequels. If we are talking about which writers have been the greatest influence in the journey to publication over the last couple of years, I’d have to say Steven A. McKay and Justin Hill. 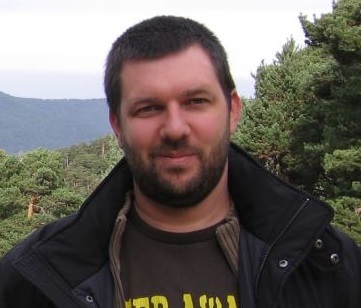 Steven is self-published and has been extremely successful with his Forest Lord series. He is a couple of years ahead of me in the process of being a published author, and I have shamelessly tried to emulate the way he handles the marketing side of the business. He has been nothing less than helpful and supportive since we first “spoke” online a couple of years ago. I read Justin Hill’s book, Shieldwall, while writing the first draft of The Serpent Sword and fell in love with the prose and the authentic feel of the writing. I was overjoyed to have Justin reply to emails and requests for information, and later to read my manuscript and offer me an endorsement for the cover. I was lucky enough to get endorsements from many other writers too, including hugely successful authors such as Angus Donald and Manda Scott, and I cannot count the number of times different writers have helped by retweeting or sharing stuff about my work, or writing nice reviews on Amazon or their blogs. The community of historical fiction writers is quite small, but almost without exception, they have been willing to offer support to a new writer with very little idea of how the business works. My TBR (To Be Read) pile is huge! I am quite a slow reader and also have to find time to write, research, do my day job, spend time with the family, sing in a band, market the book and do interviews like this. I always have a book on the go, but it takes a long time to complete each one. If I like them, I write a review and post it on my blog, Amazon and Goodreads. At the moment I am enjoying Andrew Latham’s debut, The Holy Lance. Next up is an advanced copy of The Betrothed Sister by Carol McGrath (though if I’m not careful, I won’t get around to reading it before the book is released!). I then need to get around to reading Steven McKay’s Rise of the Wolf. A bit further in the future, I am looking forward to reading Justin Hill’s “Viking Fire”, the sequel to Shieldwall. 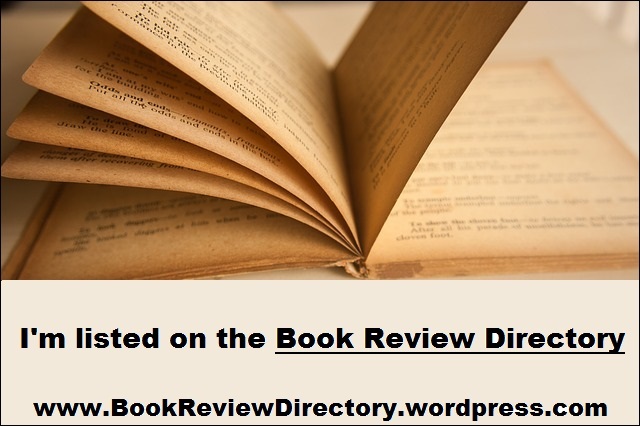 Q9 – You also review books? Any tips for me and any other would be reviewers out there? I think if a book does not light your fire, move on. Life’s too short to waste precious time on books you don’t like. So I tend to only leave broadly positive reviews (if I haven’t finished a book, I won’t review it, and I tend not to finish books I don’t like). I think reviews should be truthful and pick out a few issues (if you see them when reading the book) but without doing a hatchet job on the writer. No book is perfect, and a writer can learn from constructive criticism, but reviews are ultimately to let people know whether you enjoyed it, and why. For now, I am sticking with Beobrand and the Bernicia Chronicles. I am 75,000 words into the first draft of book 3 in the series, BY BLOOD AND BLADE. After that, who knows? There are certainly more stories in Beobrand’s future for a couple more books at least. Thanks for hosting the question and answer session on your blog, David. It’s been great fun and of course, thank you for the great review of THE SERPENT SWORD. 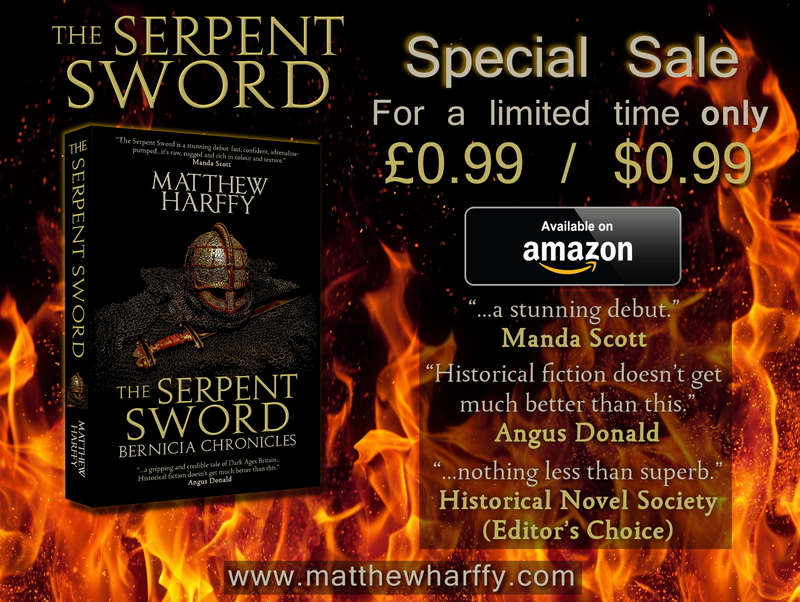 The Serpent Sword is available now for a limited time for only £0.99/$0.99. Click the picture below to head to Amazon to buy the book! 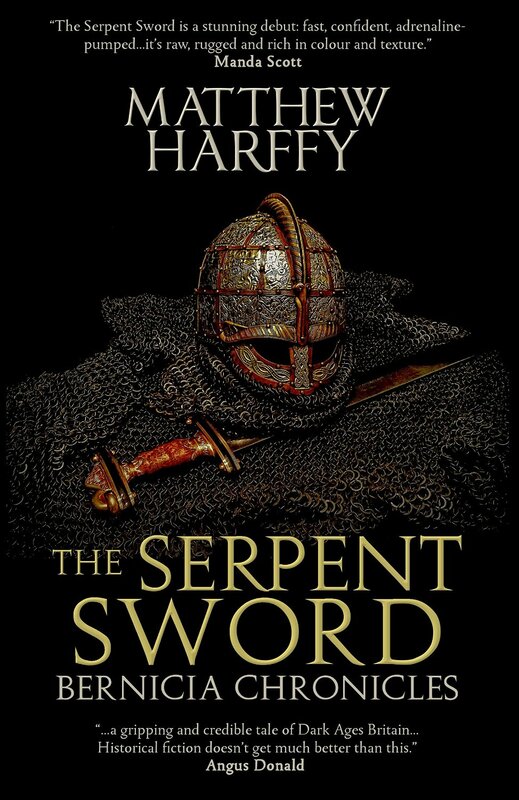 This entry was posted in 10 Questions With... and tagged Book club, Book Lovers, BookBlog, Books, Historical Fiction, Matthew Harffy, The Serpent Sword on September 5, 2015 by Bairdy1985.